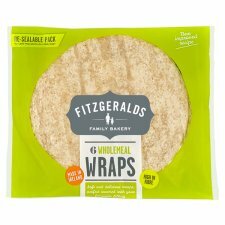 Soft and delicious wraps, perfect warmed with your favourite filling. Soft and delicious, our easy to prepare wraps are perfect warmed with your favourite fillings, and ideal for Burritos and Quesadillas. Fill your warm wrap with your favourite fillings, the options are limitless! Delicious hot fillings taste even better when toasted under the grill. Perfect sized for fajitas, quesadillas and burritos. We love baking. Our family bakery started on Blarney Street in Cork in 1910, using the best traditional methods of baking, and has been passed down through four generations of passionate bakers. It is now run by Simon, Suzanne and Garry Fitzgerald with a whole new generation of little tasters by their feet. And the care and attention to detail that began in 1910 is still at the heart of the Fitzgerald Family Bakery. Our wraps are delicious warmed. Remove from packaging and heat using the guidelines below. Then simply fill, wrap and enjoy! Place on a microwaveable plate and microwave each wrap for 10-15 seconds, or the whole pack for one minute. Simply grill or dry your wraps on a medium heat for 10-15 seconds on each side. Fold in the top and bottom then carefully roll it up. Fold in the bottom of the wrap, then carefully roll it up. Place your favourite toppings on your wrap, fold in half and grill under a medium heat for 2-3 minutes turning once. Place your favourite toppings on your wrap and heat in the oven for 3-4 minutes at 180ºC. Store in a cool, dry place away from direct sunlight until the best before date shown on the front of pack. Once opened press the reseal strip closed carefully and consume within 2 days. Suitable for home freezing. Freeze on day of purchase & consume within 3 months. Defrost thoroughly and use within 24 hours. Once thawed, do not refreeze.